My trip to OKC was sponsored by Visit OKC. ALL OPINIONS, AS ALWAYS, ARE MY OWN. SOME POSTS ON THIS SITE CONTAIN AFFILIATE LINKS, MEANING IF YOU BOOK OR BUY SOMETHING THROUGH ONE OF THESE LINKS, I MAY EARN A SMALL COMMISSION (AT NO EXTRA COST TO YOU!). READ THE FULL DISCLOSURE POLICY HERE. When I decided to go to Oklahoma City, I definitely didn’t do it based on the vegan scene. In fact – I fully intended to survive on french fries the whole weekend but I was excited to visit a new city regardless. Even my Uber driver who picked me up from the airport confirmed my initial thoughts. Before knowing I was vegan, he goes “I hope you’re not a vegetarian…” to which I replied “Nope, I’m not. I’m actually vegan.” But he also said “What is there to write about in Oklahoma City?” so despite how nice he was, his opinion is totally untrustworthy. However, I can see why he would think the way he does especially being from OKC. 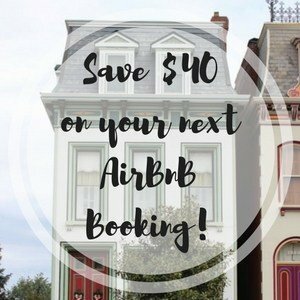 Oklahoma City is cattle country and home to the largest stockyard in the world which is located right in the city limits – you can literally be at a cattle market in just a few minutes and eat at a restaurant there. 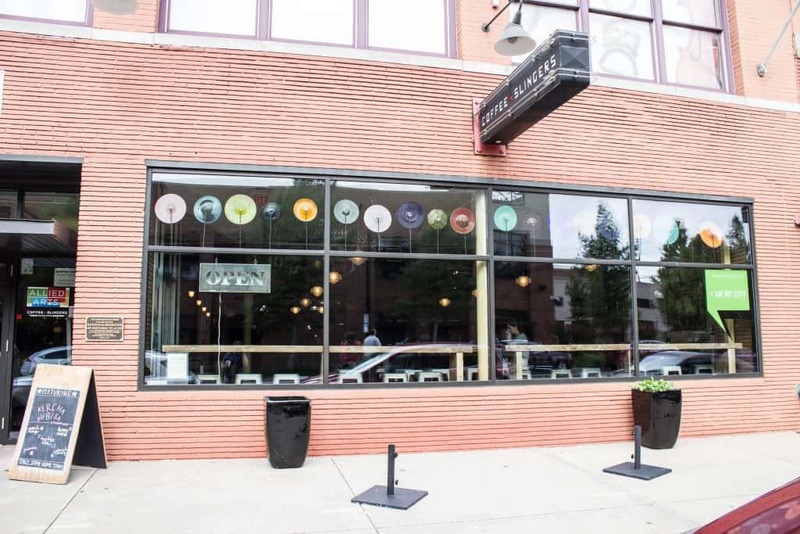 This is not the place you go to eat anything other than steak…right? I’m happy to report that’s not true at all! Times are changing – even in cattle country. 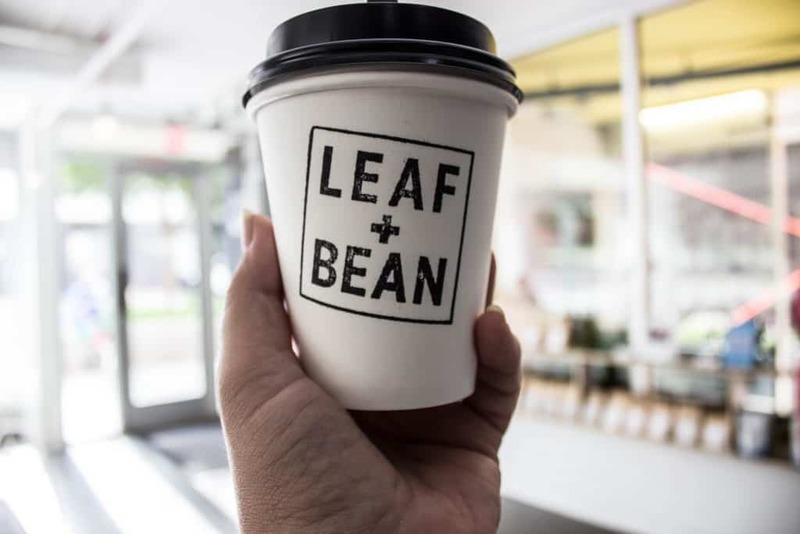 Oklahoma City’s foodie scene is growing drastically as the city is being revitalized and more and more restaurants in OKC are popping up all over the place. Right after I checked into my hotel, I immediately went to the Loaded Bowl. It had come recommended by several people and apparently, their claim to fame dish was macaroni and cheese so I was definitely there for that. 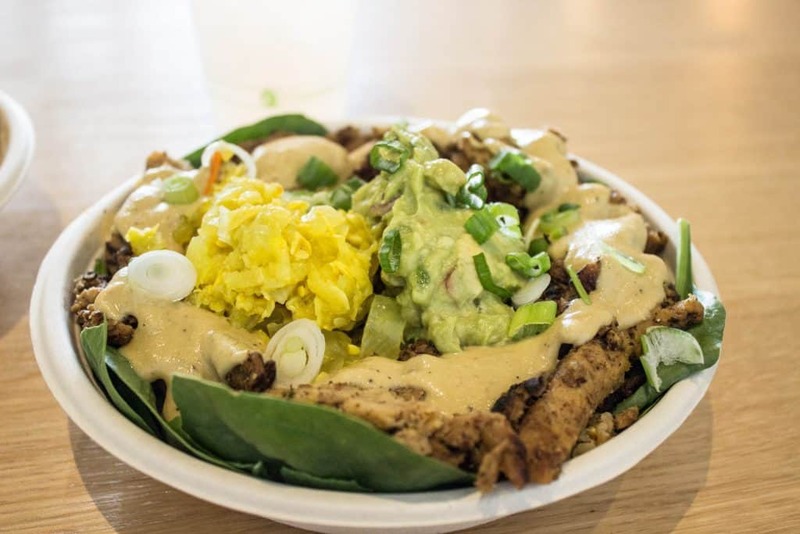 The Loaded Bowl started as a food truck and now has a lovely brick and mortar location. I got the cashew mac & cheese, of course, and the chicken melt bowl. I also got a few baked goods to go because why not. I desperately wanted to get back here before I left but with only 48 hours in the city, I never got to. I didn’t get a chance to go here but this is the other all-vegan spot in OKC. 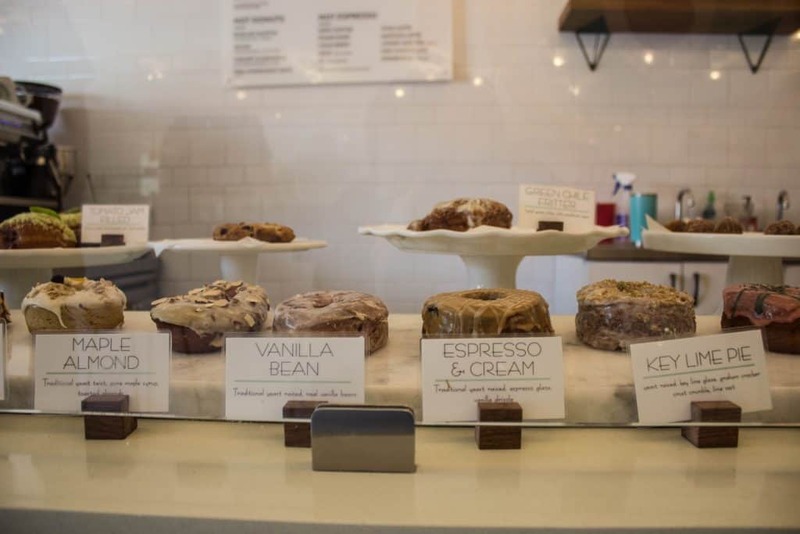 If you’re looking for places to eat downtown OKC, then Nourished Food Bar is perfect. It’s a grab & go clean eats spot with salads, soups, snacks and more! While I wouldn’t classify Holey Rollers as all-vegan, all of their donuts are vegan. They did have dairy milk options for coffee and some breakfast sandwiches that I believe had non-vegan options. 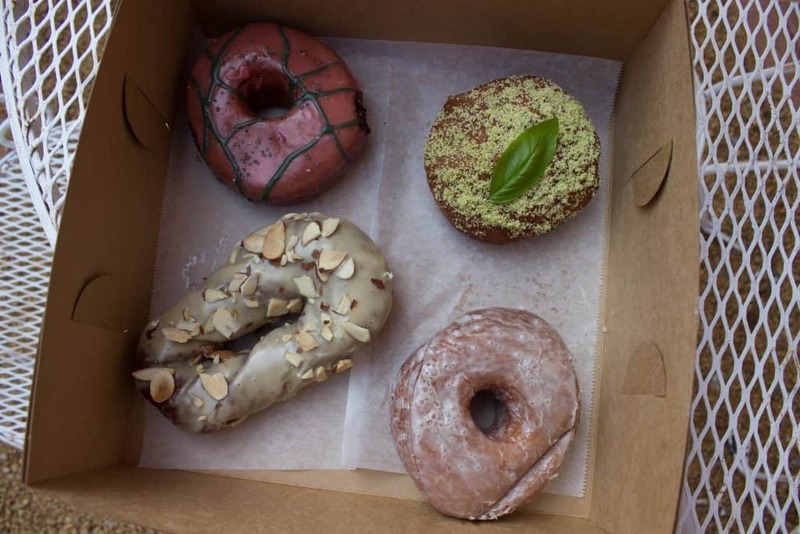 But, the donuts are what are important here – they’re all vegan, very unique flavors and extremely delicious! 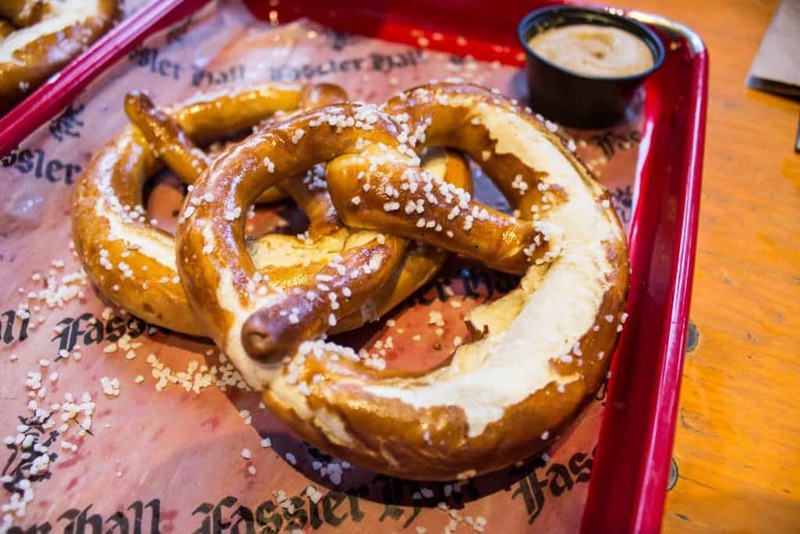 Eater even named Holey Rollers as one of the best new restaurants in OKC. Another place that I’m really bummed that I missed was The Red Cup. It is the only all vegetarian restaurant in Oklahoma City. I actually ended up driving by it and it looked absolutely adorable. It’s definitely on the top of my return to Oklahoma City visit. I was excited to find this spot as it wasn’t on any of my radars. In fact, I better add it to Happy Cow so others can know about it. 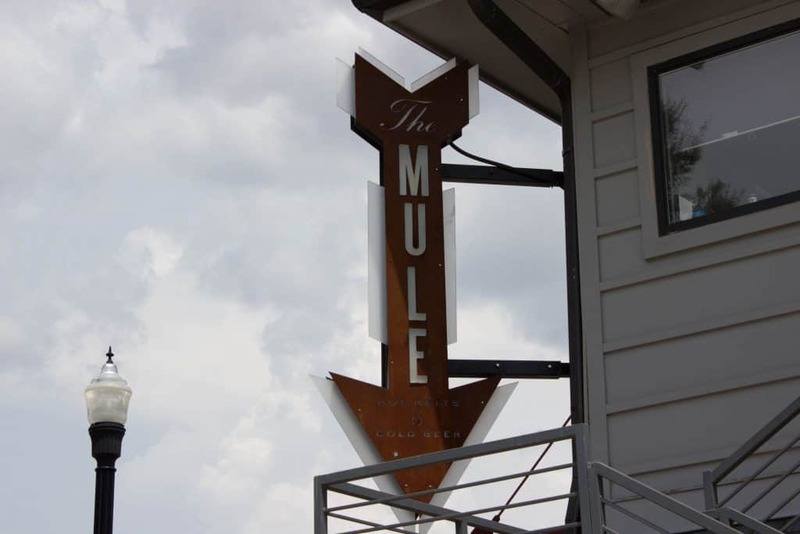 The Mule is located in the Plaza District which is one of the best neighborhoods to go to in OKC for street art. They really only have one option but its really delicious one! 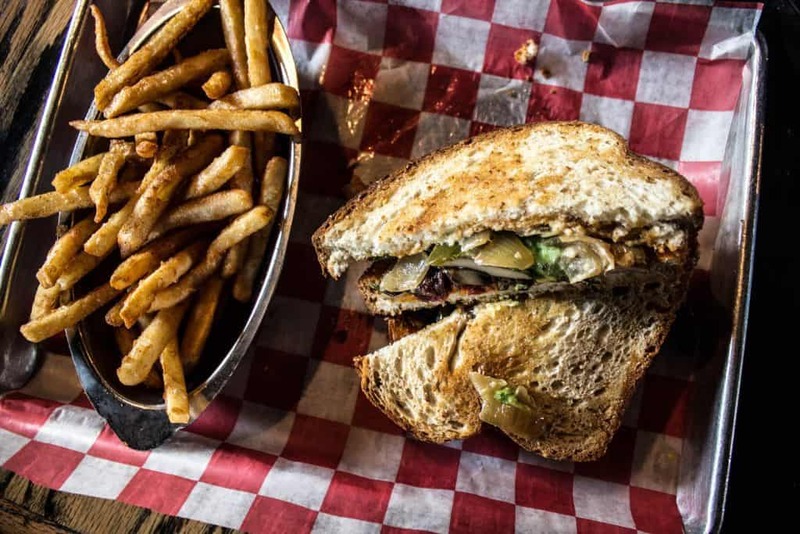 The sandwich is called the herbivore and just tell them you want it vegan – they cook it in oil instead of butter. Otherwise, its vegan as is! 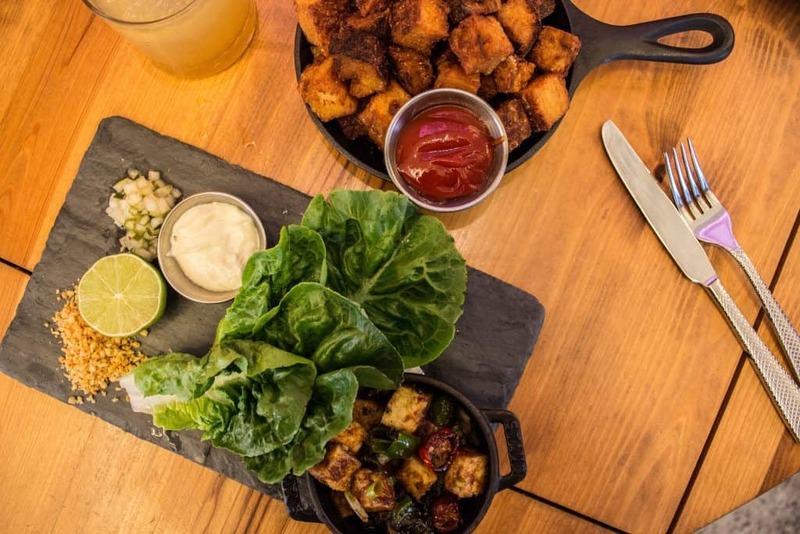 If you’re looking for the best brunch in OKC, Mary Eddy’s is a great start! This is where we had brunch before heading back home on Sunday and it was absolutely delicious. They have a couple already vegan options on the menu and have a full scratch kitchen so are willing to make you something. This is the second 21C restaurant I’ve eaten at (the first was in Bentonville, Arkansas) and I’m continuing to be highly impressed. I had the hashbrowns and tofu lettuce wraps – the aioli is vegan! The Jones Assembly is a unique spot located directly behind the 21C hotel making it a great spot if you’re staying there! It’s a restaurant, bar and event space! They have concerts and show movies in the main room which is pretty awesome! 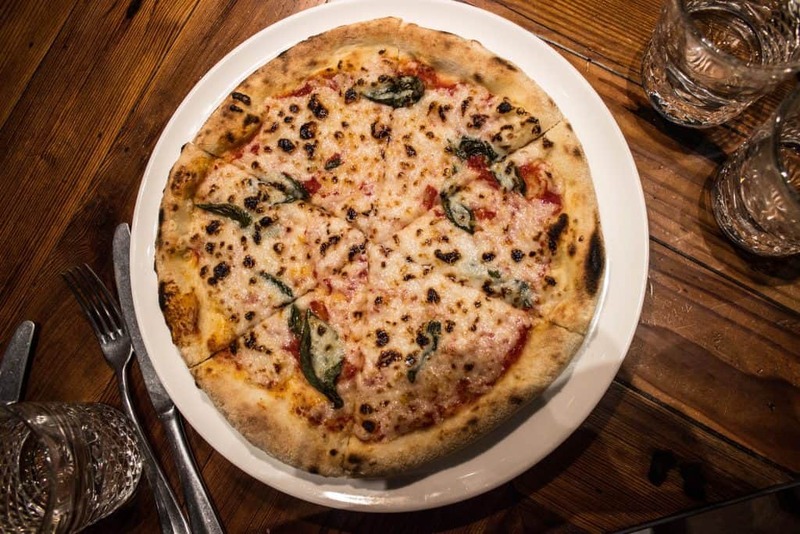 While it is mostly non-vegan food, they are well-versed in what is vegan and have a few options including vegan cheese for pizza! While I don’t eat the Impossible burger, they also have it here with cashew cheese and a vegan bun! Hours // Tue-Sat 11a-? ; Sun 10a-? Germany may be the vegan capital of the world but that doesn’t mean that traditional German food is very vegan-friendly so I was pretty hesitant to go here but they do have a few options! Their kitchen is connected to the Dust Bowl downstairs (bowling alley/restaurant) and so you can get food from either menu. This is a great place to catch some live music and hang out in a traditional German hall setting. 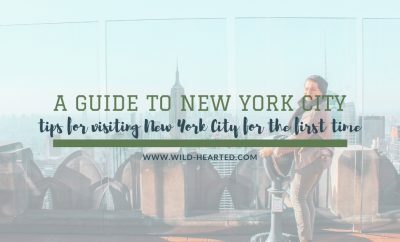 It also has a great view of the skyline so head here for sunset! I kind of wish I had tried one of the pizza places in OKC because two of them have a vegan menu! Stone Sisters has three completely vegan pizzas on their menu and they sound so good. Can’t wait to try next time! 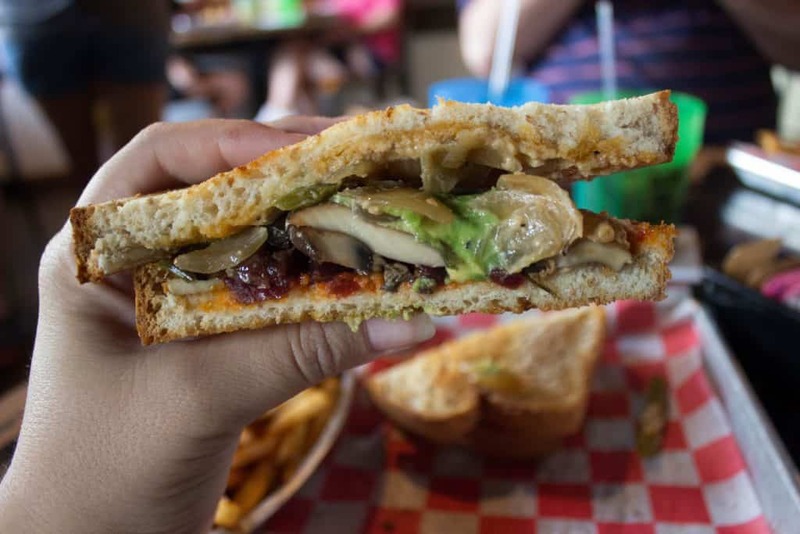 The Wedge has a full vegan menu – you just may have to ask for it! It has four appetizers, three salads, and SIX pizzas! Definitely check it out! There are also two locations – Western Avenue and Bricktown. 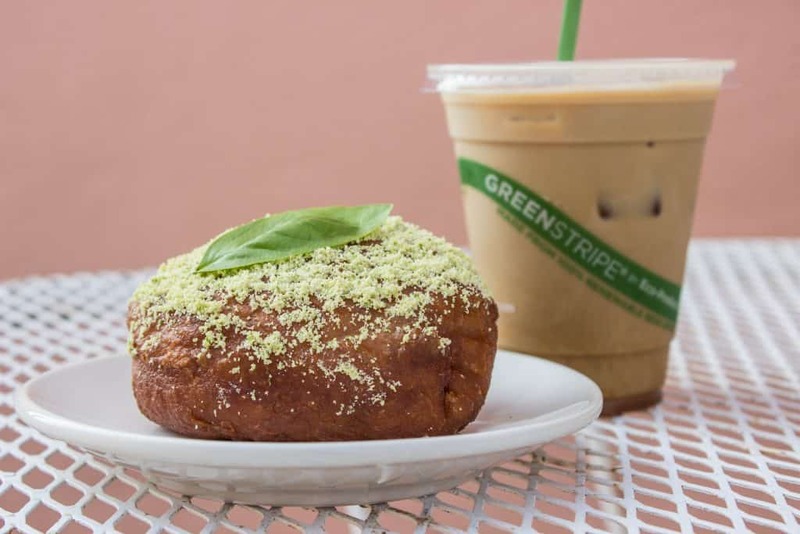 Green Goodies is a bakery with a wide selection of gluten-free and vegan options. They mainly focus on cupcakes and I can’t believe I missed a chance at vegan cupcakes. I think I’ve made it clear by now that there are enough vegan options in OKC that you can’t even get to them all in one weekend. Completely unexpected! Wheeze the Juice is located in Bricktown in the OKSEA shipping containers – a small section of shipping containers turned into businesses – how sustainable of them! Perfect place to go if you’re headed down here to take a ride on the water taxi or going rock climbing at Climb Up. Who doesn’t love corn dogs? I do but its hard to find a vegan one because of the batter! Well, fear not. Anchor Down (also in Bricktown) has a field roast hot dog battered and fried. They also have fried oreos that are marked vegan so go and bask in the deep friedness and then maybe get a healthy juice from Wheeze the Juice to make yourself feel better. 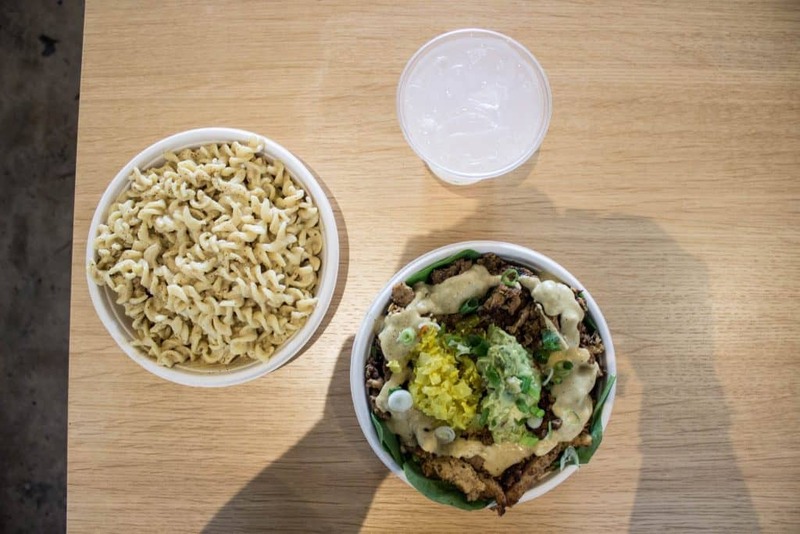 Cool Greens is a local spot with several locations (including one in the airport!) with a mission to provide healthy and natural foods. They have a very wide range of vegan options and probably one of the best vegan options I’ve seen in an aiport before! All of the below coffee shops were visited by me (yes, I consumed way too much caffeine) and have plant milk! Some even have vegan food options. 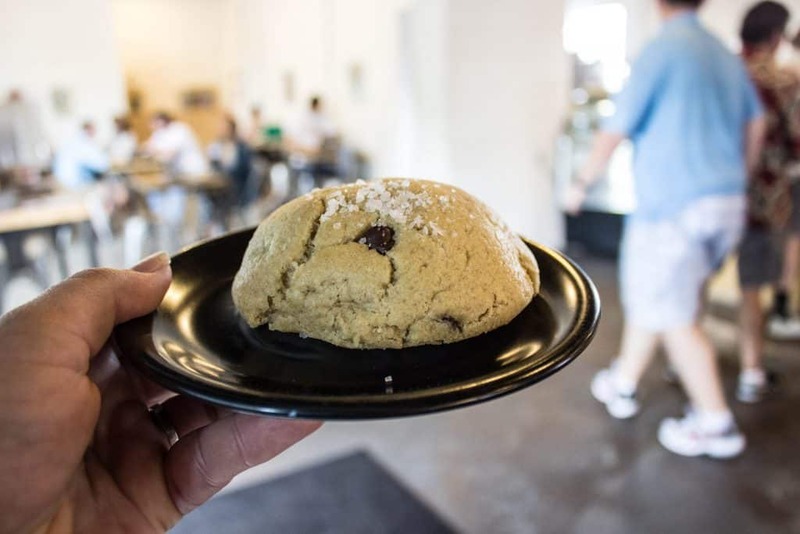 Want to try the best chocolate chip cookie in Oklahoma, according to Cosmopolitan, that just happens to be vegan?! 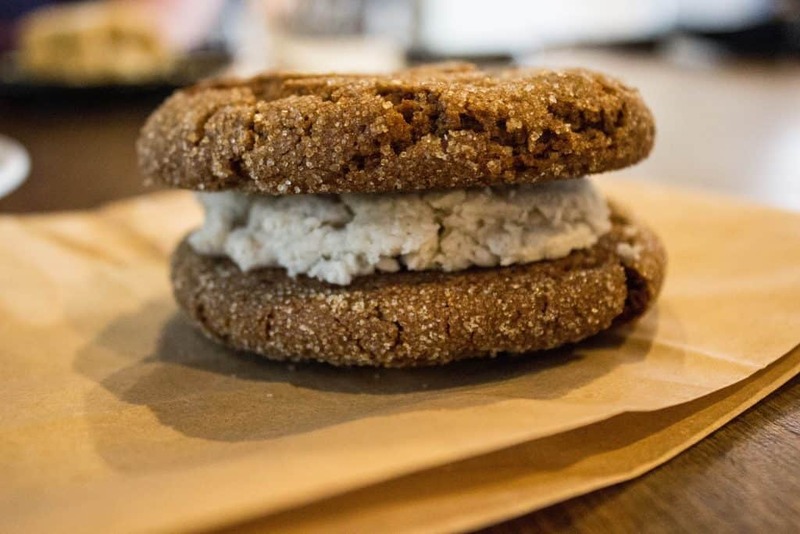 Head to Elemental Coffee in OKC where you’ll find a bunch of other vegan options as well! By the way, it was a damn good chocolate chip cookie. Stella Nova also had a vegan muffin on their menu! Oklahoma City is getting the first ever vegfest and its happening in just a couple weeks! I wasn’t able to find a local Anonymous for the Voiceless or Save chapter but will update this section if I do find one! There is a local group that takes part in events, activism and meetups – check it out here! A lot of eating happened in 48 hours but there’s so much more to do than eat. 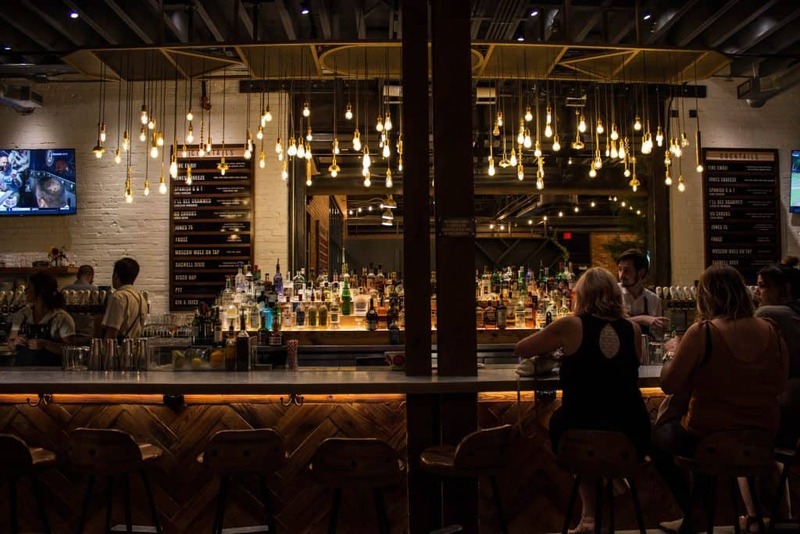 Check out A Brit and A Southerner’s post on how to spend 48 hours in Oklahoma City. Would you mind sharing why you don’t eat the Impossible Burger? I am the Regional Director for Freebird’s World Burrito in Oklahoma… we introduced Beyond Meat as an option for our Burritos and Burrito Bowls. It’s prepared with the same seasonings used for our Ground Beef and sauteed with Olive Oil, Diced Onions, and Fried Potatoes. The end result is amazing, but I am not really sure where or how to begin promoting it to the Vegan community? Do you have any suggestions? Well i will try it out! Vegan okc is a page on facebook try promoting it on there! wow! thats a fantasticist of choices to try next time i get to okc! Wow that OKC food game is unreal. I keep seeing posts shouting it out….and this many vegan restaurants? Sensational. Noted for when I travel more through the Midwest. Tweeted for you. Thanks so much for the love Ryan! The midwest is underrated! Wow. This has me thinking that going vegan isn’t as hard as it once was. That’s crazy about the cattle yard being in the city limits too. I love the variety you found. 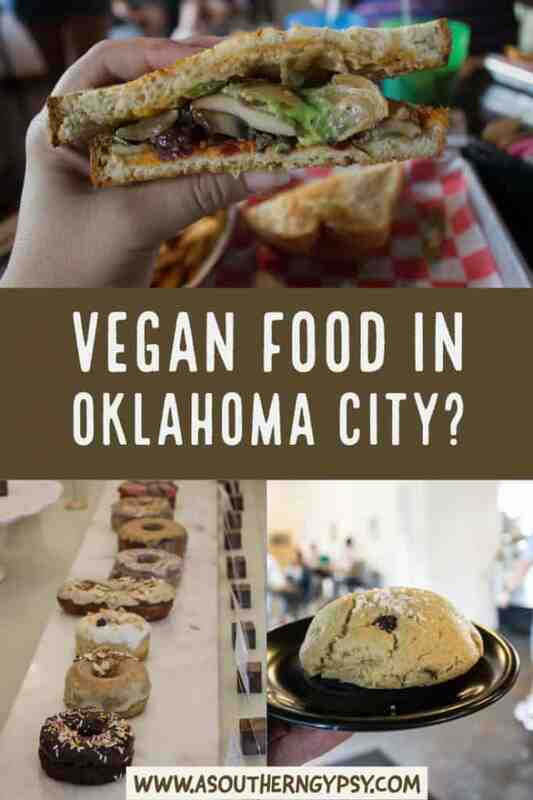 I wasn’t thinking that OKC was going to be super vegan friendly, but my lord there are a ton of options. The vegan donut trend everywhere is awesome, I have yet to try one and I need to do that asap. It’s awesome to see the large availability of vegan spots in an area that I would consider rural, even though I know OKC is a big city. I completely agree! I was so pleasantly surprised! Okay, those are some serious vegan options in OKC! And I wouldn’t trust that Uber driver’s opinion either. 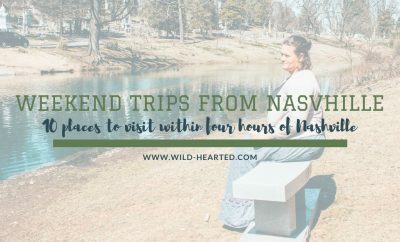 I’ve been to OKC 2 or 3 times (my best friend lived there for a couple of years) and even back when I went, I thought the city had a lot to offer! I desperately want to go back and do a proper city tour. Although I’m not vegan, I always like to try vegan options when I go places. I’m amazed at how it truly tastes no different than its “regular” counterpart. On this list, I would most like to try the Holey Rollers donuts and the Jones Assembly for the pizza! Also, I had no idea that Germany was the vegan capital of the world! I would never have guessed that! Right? German food, in general, is not vegan friendly but for whatever reason all the vegans have migrated there. 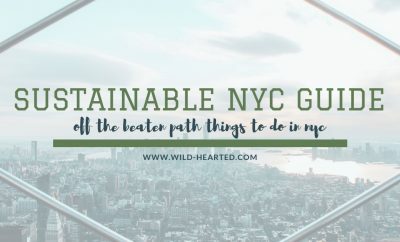 Tons of restaurants, all vegan stores, vegan HOTELS and so much more! Insane. You know I’m gluten free so I understand how difficult it can be to travel with dietary restrictions! I’m so glad you were able to find some great restaurants in OKC. Do you know if Holey Rollers had GF donuts as well as vegan? I was really interested to read what your uber driver said about there being nothing to write about in OKC. I feel like that is a common and ingrained thought that people in the Midwest have about their hometowns. I was on a press trip in Lansing a few months ago and someone (not know we were a group of people writing about Lansing, there with the tourism board) said something to pretty much the same effect. I don’t think the midwest is any more “uninteresting” than anywhere else in the US so I wonder why people here have that idea about where they are from. And, yea, very true about the Midwest. I love, love the Midwest though – it all started with St Louis. My brother went there for grad school and so I visited quite a bit and fell in love. The flyover states need love too. I’d have to be really careful on a vegan diet, because I think I’d just go for the vegan donuts and french fries! Haha, but seriously, it all looks amazing. Bookmarking this for my next trip to OKC! Haha when i travel to a place that is not vegan friendly its all fries. A plant based diet is actually the most healthy thing you can do if you’re eating whole foods but yea fries are not healthy! We have driven through OKC a couple of times and the cattle yard is enough to make you want to be a vegan. The Jones Assembly looks like my kind of place. I love vegan comfort food and that pizza looks pretty fantastic. Not going to lie – I really wanted to go to the cattle yard – not because I like seeing that stuff but because I regularly do things like that at home to get footage and “real life” experience so that when I’m talking to others about my lifestyle I know what I’m talking about. Alas, not enough time and obviously not what I was there for. I heard about OKC this May at WITS and the city didn’t strike me as a foodie city but more for outdoor adventure. I’m surprised to see so many vegan dining options there! 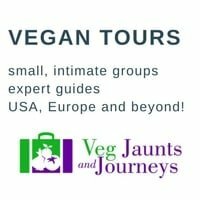 There is even a vegfest?!! Yep! This year is the first Vegfest but by the looks of things, I’m sure it will continue! 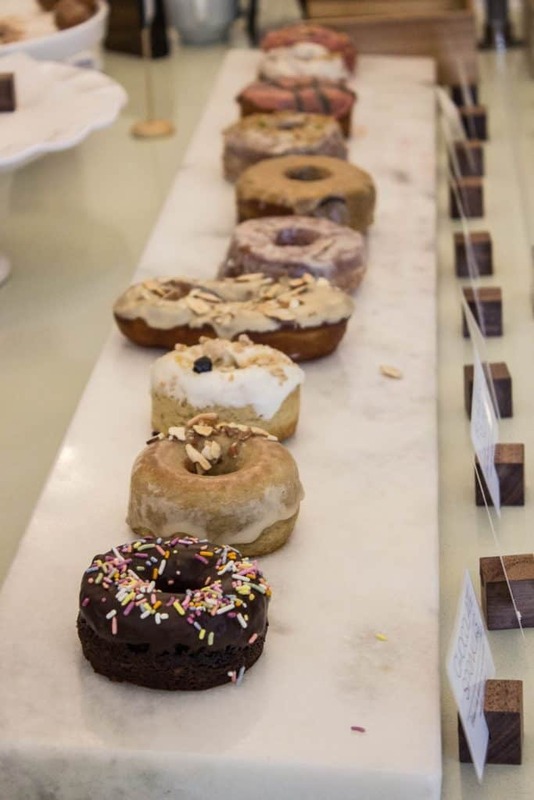 I really want to try the donuts at Holy Roller. Looks like such a great variety! Did you have a favorite? I can’t say that I think about OKC in any way, shape, or form when I think of culinary destination travel. And — like you, I would have expected vegan options to be minimal to non-existent. Isn’t it nice to be surprised in a good way? 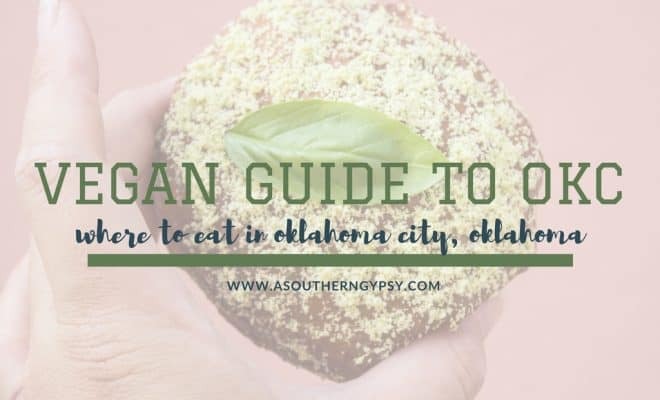 And of course, now that you’ve published a guide, other vegans thinking about visiting Oklahoma City will feel more confidant they can eat something other than french fries. It’s so wonderful to be surprised and yes I hope this helps other vegans as there wasn’t a ton of material on the subject! They had a watermelon lemongrass that was my favorite! Such a unique combination but I’m a fan of lemongrass anything! I loved your intro about the Uber driver — so funny. Also loved learning more about Oklahoma City and its vegan scene — two things I would never have thought of putting in the same sentence. It’s great to know that there’s so many options! 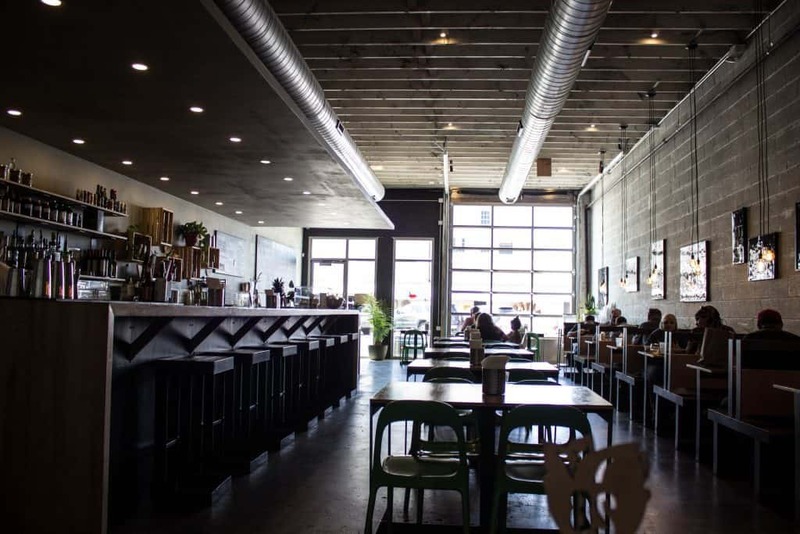 You’ll probably find me at Elemental Coffee — that vegan chocolate chip cookie sounds fantastic. Right? Never thought I’d put those two things in the same sentence either. Glad to be proven wrong! The loaded bowl is the best vagan restaurant in Okc. Its deluxe menu cover offer variety of vegan dishes.